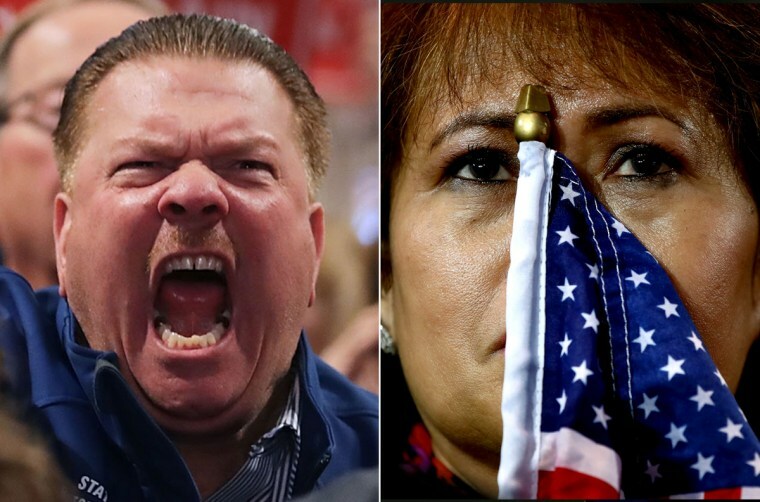 The 2016 election exposed an America of deep divides over race, ethnicity and culture — a nation carved into two large coalitions, roughly equal in size but radically different in demographics and desires. Those contrasts were brought into sharp relief in the hours after Donald Trump was elected president. Voters in the Rust Belt and rural regions of country who felt left out of Obama's vision of economic prosperity and progress celebrated, in part, because they felt they once again had a champion. Meanwhile, across the country, thousands of minorities, millennials and women in urban enclaves went into a period of mourning and took to the streets in protests fueled by frustration, fear and disillusionment in a country they feel that, by electing Trump, is now entering a dark and divisive era. “The biggest difference between the two parties is the urban-rural divide. That gap widened. Politically, that translates into race and identity as the main political dividing line. Rural and exurban America is very white, and generally inward-looking. Urban America is very diverse and cosmopolitan,” said Lee Drutman, a political scientist at New America, a Washington-based non-partisan think tank. The electorate coalitions in 2016 were similar to the 2012 election, with one major exception: white voters without college degrees, already a Republican-leaning bloc, shifted decisively to Trump. According to exit polls, whites without college degrees favored the real estate mogul by 39 percent (he won 67 percent of their votes, compared to 28 percent for Hillary Clinton.) That gap was only 25 percent in 2012, when Mitt Romney won 61 percent of the non-college white vote, compared to Obama’s 36 percent. In 159 counties, mostly in the Midwest and Appalachia, Trump ran 12 percent better than Romney, according to TargetSmart, a political data firm. In effect, non-college whites voted as a bloc for Trump, in the same way that blacks, Latinos, and Asians have overwhelmingly supported Democrats and that evangelical Christians have backed GOP candidates in recent elections. White college graduates were essentially equally divided between the two candidates, with white college educated men favoring Trump while college educated women favored Clinton. Trump’s electoral margin came in part from very narrow wins in Michigan, Pennsylvania, and Wisconsin, states with large groups of non-college whites. Clinton is likely to win the national popular vote in part because of her huge advantage in California, the nation’s largest state and one that is about 39 percent Latino. America has long been deeply-divided politically. With the exception of Bill Clinton’s 1996 victory and Obama’s in 2008, recent national elections have been very close. Democrats bitterly protested the 2000 Supreme Court decision that helped ensure George W. Bush won that election. Down in a very close race, John Kerry refused to give his concession speech the night of the election in 2004, like Hillary Clinton this week. Mitt Romney’s defeat in 2012 was narrow and some pre-election surveys had shown him ahead. What has shifted—and became more apparent during 2016 and was cemented on Tuesday—is the nature of that divide. Many of the defining arguments of elections from 1980-2012 were about national security and the size and role of the federal government. Republicans tended to be more skeptical about expanding programs while more assertive about deploying U.S. military power abroad, while Democrats were more pro-government and anti-war. Now, the political divide is much more about culture, identity and race. “In 1992, a majority of the voters in both parties were white Christian. Today, the GOP has essentially become a party of white Christians, while Democrats rely on a coalition of religiously, racially and ethnically diverse voters,” said Daniel Cox, research director at the non-partisan Public Religion Research Institute. Hillary Clinton ran a campaign that appealed to the new Democratic coalition. Her aides, trying to emphasize that she was truly committed to the African-Americans who backed Obama in 2008 and 2012, regularly noted that she gave one of her first major speeches in her 2016 campaign on issues of race and criminal justice. She strongly supported allowing undocumented immigrants to become citizens, a direct appeal to Latinos. Clinton gave more speeches about racial issues than Obama during his runs and strongly embraced the Black Lives Matter movement. Her casting of some Trump’s supporters as “deplorables” fit with Clinton campaigning as the champion of whites and non-whites who take pride in inclusion and racial diversity. Clinton tapped Tim Kaine, a white Catholic, as her running mate, a move that seemed aimed at religious voters. But Kaine also fit with Clinton’s strategy of winning the election in part by increasing Latino turnout. He frequently spoke Spanish on the campaign trail. Defeated on Election Day, Clinton’s coalition is frustrated, like Trump supporters have been much of the last eight years. “Race remains the organizing principle of American politics, and racism is alive, well, and in fact, popular,” says Heather McGhee, president of the liberal group Demos Action. “White America elected Donald Trump, just as the majority of white voters have supported every Republican presidential candidate since Lyndon Johnson signed the Civil Rights Act. Trump Win Leaves Questions, Anxiety for Many Minorities in U.S. Early in Obama’s tenure, the Tea Party movement emerged in opposition to him, and conservative resistance has endured over his eight years in office. Now, an anti-Trump movement appears to be organizing, even before he officially takes office. “I'm not going anywhere. This is my country, too. We will organize, plan, & fight for a better America. But I'm not going anywhere,” said Deray McKesson, an activist heavily involved in the Black Lives Matter movement.